Introduced in 1948, the Symphony was one of the first pens aggressively marketed as styled by a famed designer  in this case, Raymond Loewy (1893-1986). Eversharp was a pioneer in hiring well-known industrial designers (the Skyline, introduced in 1941 and produced in great numbers, had been designed by Henry Dreyfuss), but oddly enough the resulting pens have been almost entirely ignored in discussions of the designers' oeuvres. With the Symphony, as with the Skyline, Eversharp embraced a modernist aesthetic while retaining a fundamentally traditional approach to the functional aspects of fountain pen design. The filler is the tried and true lever, while the exposed 14K nib is entirely conventional. The Symphony was offered in a relatively limited range of variations. Caps came in two basic shapes: either round in section (see above), or the so-called slipper cap (below), with slightly offset halves that meet in a longitudinal ridge in a form strongly reminiscent of Loewy's classic streamlined Electrolux vacuums. As only the earlier and less common slipper-cap version was advertised as a Loewy design, it seems likely that this was the only version for which Loewy was entirely responsible. The standard cap finish was chrome with a gold filled clip, with or without a single narrow inset gold filled cap band. A Deluxe version was equipped with a wide cap band (see below), while the Golden Symphony had an all gold filled cap. The "$5 set" included a pen and pencil with gold-plated caps, advertised in late 1949 as "A luxury set at a pre-war price". The Symphony was one of the last high quality fountain pens Eversharp offered. 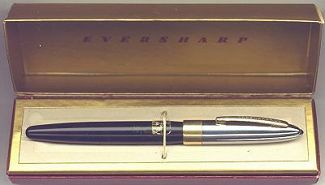 Reeling from its losses in the battle for the ballpoint market, Eversharp found itself short of the capital needed to compete with giants Parker and Sheaffer. In 1957 Eversharp was absorbed by Parker, which continued for a time to produce pens under the Eversharp name as an economy line.